That's five price drops in a year on the 30.96 classic Burger motor yacht Ar-De as Chris Chumley at Northrop & Johnson brings news of another slide of $250,000. 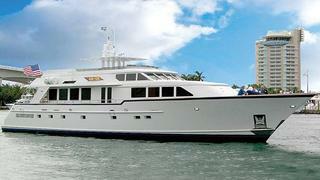 Built for experienced owners and delivered in 1996, she was designed for world-wide cruising in comfort. Accommodation is for six guests in a full beam master suite plus a double and a twin cabin. Ar-De is an open, uncluttered yacht with hide-away window shades, abundant enclosed storage, and screens on all opening doors and ports. Butternut wood, carefully hand-finished with raised panels, is used for bulkheads and furniture to create a soft, rich interior. Twin 1250hp Caterpillar engines give her a cruising speed of 16 knots. Easy to inspect in Fort Lauderdale, Ar-De is now down from $3.5 million to $3.25 million.